I received a call from mom late last week and she said, "We're in the bean business!" I headed over and snapped while she started the canner. 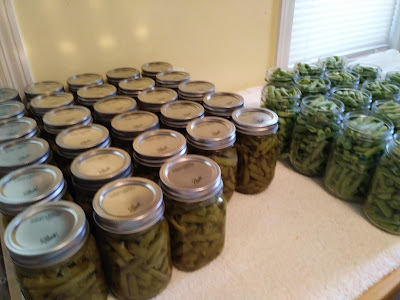 That, my friends, was only the beginning of the canning frenzy! As the beans came off more we're ready to go on. The total so far is 97 pints. There are more to come. Sunday evening I picked and there are enough green beans to begin again. So far the garden is doing really well. Today pickle relish was on the agenda. It has a very good flavor. It's another one of those things that is easy to make and only requires a water bath caner. Here is the recipe if you are interested. 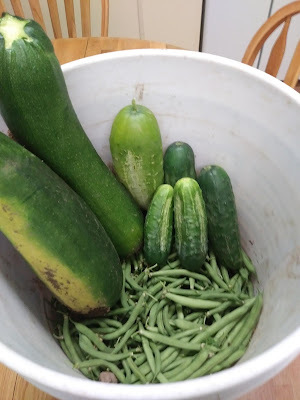 6 lbs of cucumbers, seeded and diced. Run through food processor, chopper or dice fine. 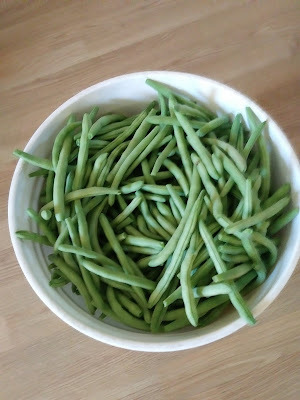 Cover with 1/2 cup canning salt and 2 quarts boiling water. Stir and let sit for 1 hour. Bring to a boil and boil for 1/2 hour. Spoon into hot pint jars and process for 10 minutes in a water bath canner. Here is your gardening bonus for today. If your soil is wet tie plastic grocery bags around your shoes. The mud will not stick to them like it does to shoes or boots. Best gardening trip I've ever learned! Next on the preserving list is bread and butter pickles. If you need me you'll find me in the kitchen! This a place where I share how I've stretched a penny, saved a penny and in many cases spent no pennies. While on vacation we paid the teenage daughter of a friend to water my flowers. The first time Chuck turned on the hose water sprayed all over him. Oops! The hose burst while we were gone and it had been taped where it split. At first Chuck was going to remove the hose so we could purchase a new one. On second thought he said that he could cut off the section that was broken and buy a new connector. For $6.00 Chuck was able to repair the hose. We lost about 10 feet of hose. No big deal, especially when you consider it would have been close to $100 to replace our 200 feet hose. Good job, Chuck! The day after we arrived home my laptop died. I was not a happy girl. Especially since I had uploaded all of my pictures from our trip. When we went to look at laptops there were several on clearance. This new laptop cost less then $200! Did I want to spent $200? No, but it was much better than full price. Patsy at A Working Pantry has a $5 or less pantry challenge. She will take five dollars a week and add to her pantry. This is separate from her regular grocery spending. Since adding to my pantry is a goal of mine I decided to take up this challenge. Kroger had a Saturday deal where ketchup was 99 cents each when you downloaded their coupon. The limit just happened to be 5! This is a huge score on two counts #1 we go through a ton of ketchup and #2 I haven't been able to find my target price of $1.99 in a long time. It's a great reminder to tackle our financial goals bit by bit. So there you go. I hope this encourages you to do things to save money. The old adage that every penny counts seems to apply more and more these days. I find it's much harder to stretch my pennies into nickles. *smile* I find it encouraging to hear about other frugal adventures and I hope you do also. We arrived home just in time to catch the end of strawberry season. When we arrived we were told that it had been a busy season and we'd need to be exuberant for u-pick. Megan dove right into the berries. Well, that is until she found a stink bug in her box! We had quite a chuckle from her reaction. 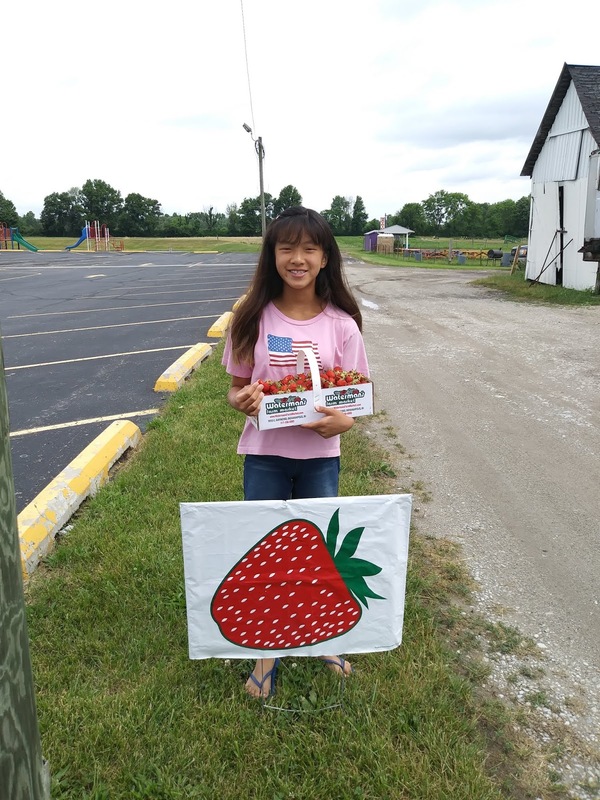 There is nothing quite like local, fresh strawberries. They were eaten plain and sugared over angel food cake. Of course, I had to make jam. We have already had a sample and it's delicious! 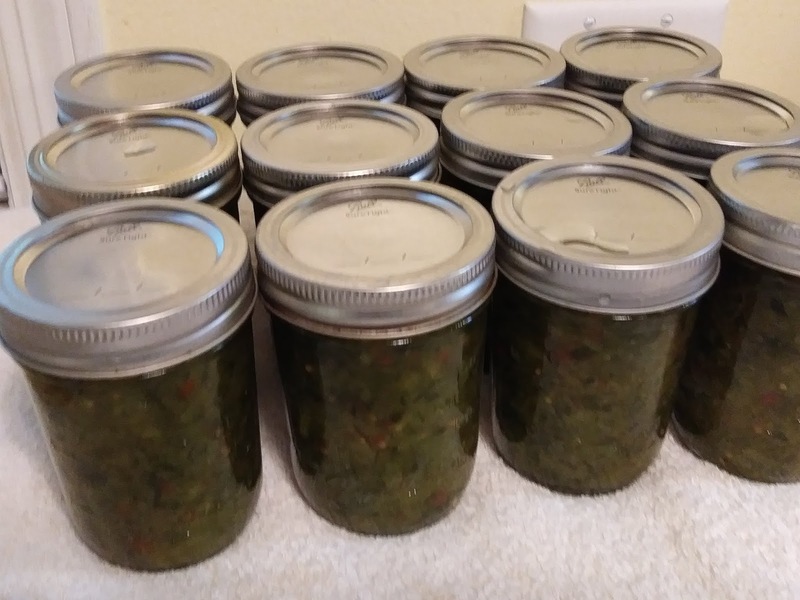 If you are new to home canning or want to give it a try for the first time I recommend that you start with strawberry jam. It's super easy! We prefer the cooked method. I follow the direction that are provided in the Sure Jell package. I know that many like the freezer version. So roll your sleeves up, put on an apron and get in the kitchen! No matter which version you choose I know you won't be disappointed. Vacation was the best, but home is even better! Once home I started unpacking suitcases while Chuck was still emptying the van. I'm weird about that. I start laundry, put things away, and am not ready to settle back into home life until the suitcases are ready to return to the attic. That's just how I tick! After that I finished up my grocery list. Unless we wanted to live on pickles with your choice of condiment sauce and a sprinkle of yeast a grocery run was a must. I had been shopping light, and eating out of the pantry for a couple of month. We had no fresh foods and were out of chicken. That wouldn't fly since we eat chicken often. I had let Chuck know that I needed to do a big shop once we returned home. I scanned grocery ads, had my list in hand and we headed out bright and early. First stop was for a quick bite for breakfast and then the fun began. I hit four stores and we are now super stocked! I feel like I have been on the move since we arrived home. There was a ton of outside work to catch up on. The garden is looking well and thankfully the weeds weren't too bad. I jumped right back into homemaking and there have been some things to pull me from home. It looks like things will start to settle down. I don't like to keep a crazy schedule and am working to get it back under control. I want to be able to enjoy home, summer and have lots of time to visit my parents' pool. Once I get back into my groove I will share about our trip and a unique stop we were able to make on our way home. As great as it is to go on vacation it is even better to be home sweet home!